tmmcmusic: Have you noticed the list of bands? Have you noticed the list of bands? Top of the list is Big Wes Turner’s Trio. You can hear them in August four times, but only if you hurry. 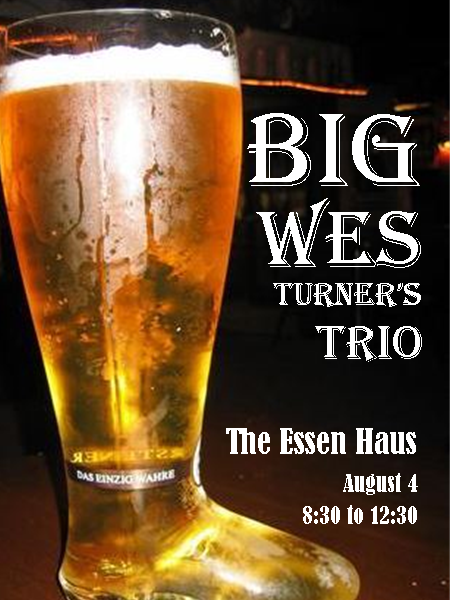 First August gig is tonight (Thursday, August 4) at the Essen Haus. Miss them there and you’ll get another chance on the deck at the Rockdale Bar & Grill on Sunday afternoon, August 14, at the Essen Haus on August 18, or The Varsity Club on August 27 (if you're heading North, take the free ferry across the Wisconsin River to Merrimac, turn left, then keep eyes right). Next on the list is the Birddog Blues Band. Hear them on August 25. It’s an early evening concert right outside the Green County courthouse in Monroe, Wisconsin. Also on the bill, the fabulous Family Business. Faux Fawn was a busy, busy band last week (see most recent post) and will be busy again during Appleton’s amazing Mile of Music celebration. Previous commitments will prevent Tom from participating, but if you have a taste for smart, wholly original songwriting, seek Paul Otteson and friends out. And what about The Maintainers? These tenacious badgers of the Blues, featuring guitarist Mel Ford and harmonica-man Frankie Lee, carry on Madison’s Blues tradition. The full quartet, with Mark Haines on drums and Tom McCarty on bass, play the patio at Tyranena Brewery, Friday, August 12. Hear them again on Saturday, August 20 at The Varsity Club in Merrimac. Next post will have more than just a laundry list of what Mr. McMusic is up to. Next time we will delve deeply into the nature of "ART" as it manifests itself in bands that play in bars. Your reactions and engagements will be encouraged. Promise!